Providing training and resources, MakerHealth helps nurses and doctors hack medical equipment to improve patient care. In hospitals in North and South America, nurses are hacking medical equipment to improve patient care. Using off-the-shelf materials, they’ve created prescription bottles for the visually impaired, pipe systems to irrigate wounds of burn victims, low-cost feeding-tube holders, and other innovations. These are products of MIT spinout MakerHealth, a company providing training and resources — and even furnishing on-site makerspaces — to encourage nurses to become makers. Working the front lines of health care, nurses can often spot opportunities for improving medical devices or creating new ones. They might think, however, that writing a grant or creating a go-to-market strategy is the only way to get the idea off the ground. MakerHealth offers an alternative. 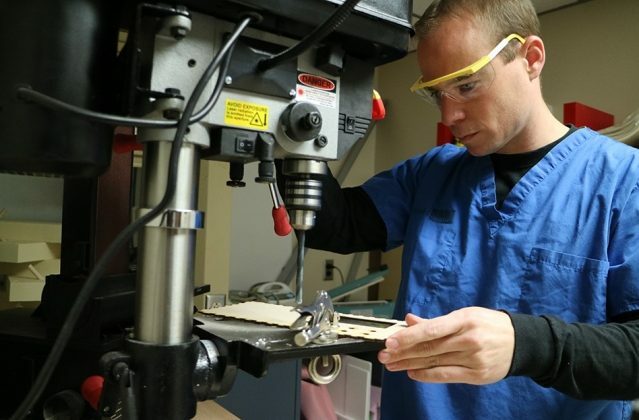 So far, MakerHealth has built makerspaces at the John Sealy Hospital and University of Texas Medical Branch, in Galveston, Texas, and at South Shore Hospital in Weymouth, Massachusetts. The design of the makerspaces is led by Principal Engineer Nikolas Albarran ’15. The company has also delivered toolkits — collections of materials and tools for hacking hospital equipment — and run workshops at a dozen other hospitals, in New York, Virginia, Nicaragua, Ecuador, and elsewhere. In late November, Young traveled to Chile to speak with the Ministry of Health about establishing a national MakerHealth certification program, which would train clinicians to create medical devices and navigate how to advance a prototype. “We’ve trained over 600 clinicians on different prototyping technologies and methods. But to have a Ministry of Health-approved certification on the training framework is a major step,” Young says. In a separate piece of good news for the startup, through the MassChallenge 2017 accelerator, MakerHealth last month received a grant from Boeing and the Center for the Advancement of Science in Space — $500,000 to split with two other MassChallenge teams — to trial in the International Space Station a modular biochemical manufacturing platform the team created. The device consists of a chain of small plastic blocks that can be filled with different chemicals. Chemicals pass between blocks and react with each other. Blocks can be switched around and removed, allowing for rapid testing of reactions between two or more different chemicals. As gravity plays an adverse role in fluid flow, using the device in microgravity will improve the device’s reliability and speed, according to MakerHealth. The device could be used by biologists and medical professionals to create diagnostics, nanoparticles, bioprocessing procedures, and one day, pharmaceuticals. In the mid-2000s, Gomez-Marquez, a Honduras native who comes from a family of medical professionals, formed several teams to compete in the MIT IDEAS competition, pitching inventions such as an inhalable vaccine for measles and an ultrasonic cane that bounced signals off walls to alert visually impaired users. In 2008, he was hired to teach a medical device design class and run a global health initiative out of MIT’s D-Lab. There, he met Young, a maker and researcher who had developed, among other things, a solar-powered autoclave to sterilize medical instruments in off-grid and rural clinics. In her travels to developing countries, she had noticed clinicians making modifications to medical devices to help treat patients. Inspired to bring MIT’s rapid-prototyping spirit to hospitals in developing countries, the two researchers earned a grant from the Inter-American Development Bank to pilot a maker training program in Nicaragua. They brought hardware and resources to two hospitals in the country, training the clinicians with the MIT curriculum. Results were impressive: Nurses created, for instance, a centrifuge from a toy Ferris wheel and an IV alarm using a toy gun that shot off when the bag drained too much. Today, MakerHealth makerspaces include custom designed modules, tools, and machines geared toward the challenges facing clinicians, such as issues with telemedicine and acute patient care. Over the years, MakerHealth clinicians in the Texas and Massachusetts hospitals and other places have created numerous notable projects. There’s a modified Raspberry Pi that images pathology samples — a $100 device that replaces a $100,000 machine — and a more secure infant CPAP mask that keeps the tubing in place by stringing it to a hat made from a compression sock. One nurse, Ernesto Holguin, recently received MakerNurse’s InfyMakers award for a Raspberry Pi-powered diabetic foot monitoring device he hopes to deploy in his El Paso, Texas, hospital. Some fairly simple yet effective ideas include spraying nearly identical pills with different colored icing to differentiate them and a hands-free nebulizer made by the parent of a cystic fibrosis patient. More complex projects include a smart spirometer, powered by a Bluetooth microcontroller, that sends patient data to a mobile app. Some of the most creative inventors work in wound care and critical care units, Young says. Jason Sheaffer of the University of Texas Medical Branch, for instance, erected a system of PVC pipes with holes in them over a burn unit tub where burn victims are treated. Running water through the pipes creates an irrigation system to aid in treatment. A wound vacuum kit, developed at the UnityPoint Health in Cedar Rapids, Iowa, has a modular alarm to alert the care team when suction is lost. There’s also a 3-D-printed simulation model, created by Roxana Reyna, a nurse in Corpus Christi, Texas, that has a deep hole in it, representing a wound. Nurses can practice treating the wound on the model, instead of on a live, suffering patient. Recently, the company launched a “Makerspace in the Cloud” license that is available to hospitals and medical and nursing schools. This platform guides clinicians through fabrication and testing processes, “prescribing” suggested tools and materials, features, and designs. As part of the platform, makers are also guided through efficacy tests, evidence gathering, and approval processes for their devices. MakerHealth is currently focused on refining the cloud-based platform and growing the network of hospital makerspaces. Apart from its Chile initiative, the company is also gearing up to expand into Africa through collaborations with iLEAD in Johannesburg, South Africa, and Dakar, Senegal, in partnership with the Klapperich Lab at Boston University, with support from the Bill and Melinda Gates Foundation. “We set out to democratize the tools to create medical devices. We are so excited to now support a global community of health makers who are not only creating the devices, but sharing them,” Young says. Reprinted with permission of MIT News.